The GEOPOWER Multicore Round Cables are an eco-friendly choice and are manufactured in a high technology production facility. These Multi core cables have higher flexibility due to larger number of strands in the conductors and are used for Machine Tools, Appliances, Machinery, Industries ETC. 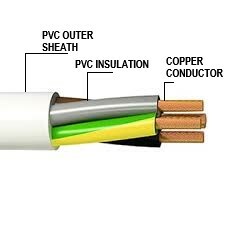 These cables are Perfect for installation in all electrically operated machines and equipment’s such as air conditioners, refrigerators, motors and other appliances. These wires are flexible and provide the best-in-class protection all around. These wires are manufactured from bright-annealed 99.97% pure bare copper conductors and hence, offer low conductor resistance. The sheathing is provided with a specially formulated PVC compound to facilitate to withstand all kinds of mechanical abrasion while in use. Pvc compounds used have high Oxygen Index and High Temperature index thatnRestricts the spread of fire even at high temperature.